Some describe Fortnite as a battle royale game, where the objective is to be the last among 100 combatants standing. I say those people have it all wrong: Fortnite is a parade, and you win by having the fanciest pants, pickaxe, and glider in the match. And since this interpretation is clearly 100% correct, I'm pleased to inform you the Microsoft now has a Fortnite Xbox One S bundle that is sure to help you win. 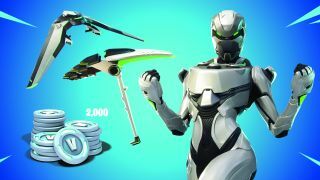 The recently-unveiled Xbox One S Fortnite bundle, which you can buy on the Microsoft Store for $299, includes a standard white Xbox One S console and controller, a download for Fortnite itself, a Legendary Eon skin for your avatar, unique pickaxe and glider skins, plus 2,000 V-Bucks (a roughly $20 value). You'll also get a 1-month trial of Xbox Games Pass. The bundle, for now, is the only way you can get these skins. Granted, they are just recolors of existing items you could have already earned (the Eon skin is a revised Criterion, the pickaxe is Onslaught, and the glider is based on Terminus) but there's just something that makes you feel all warm and fuzzy from having a rare, unique look to your character. If I see you killing me while repping this very Xbox-y getup, I won't even be mad. The Fortnite Xbox One S bundle arrives just in time for Fortnite season 6, so jump on now to be the freshest prince gliding through the air.